Two of the symptoms of the economy's malaise are slow wage growth and increasing wage disparity. Tariffs are being added as solutions to these issues. Radical leaders are increasingly being elected. The Bank for International Settlements and the International Monetary Fund have raised concerns about the world's aggregate debt levels. The IMF has even suggested that a second Great Depression might be ahead if major banks should fail in the manner that Lehman Brothers did in 2008. One point of confusion regarding whether today's oil prices should be of concern is the fact that the maximum affordable oil price seems to decline over time. This happens because workers around the world increasingly cannot afford to buy the goods and services that the world economy produces. Inadequate wage growth within countries, growing globalization and rising interest rates all contribute to this growing affordability problem. To make matters confusing, this growing affordability problem corresponds to “falling demand” in the way economists frame the issues we are facing. 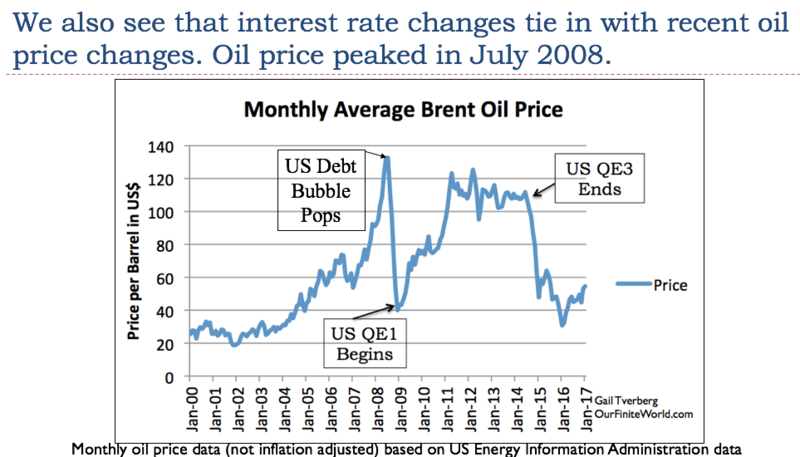 Thus, our concern about adequate future oil supplies should perhaps be focused on keeping oil prices high enough. 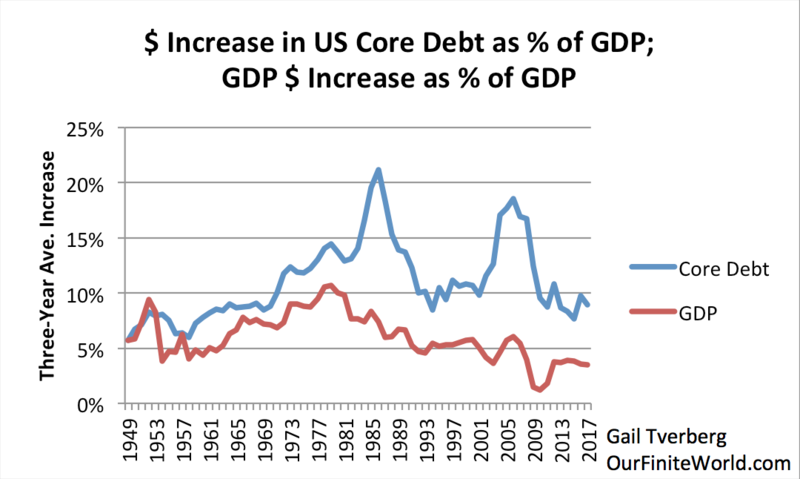 It takes a growing debt bubble to keep oil demand high; perhaps our concern should be keeping this debt bubble high enough to allow extraction of commodities of all kinds, including oil. 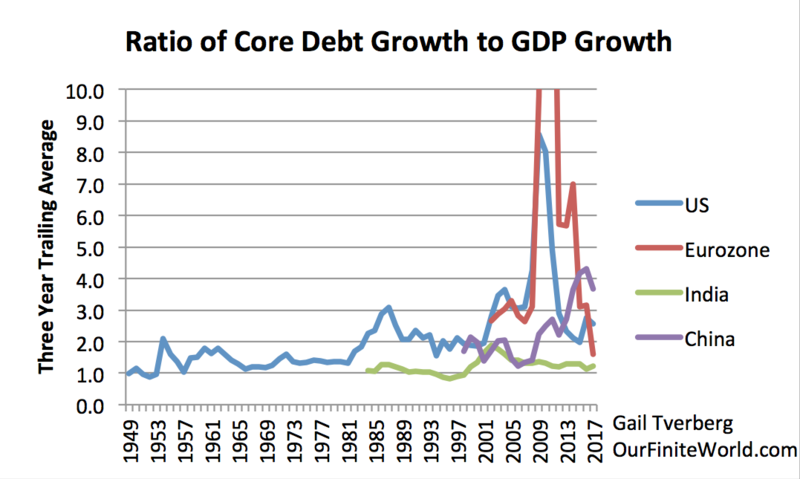 Figure 1 seems to show a recent downward trend in Debt to GDP ratios for the Eurozone, the United States and China. This may be part of today's low price problem for commodities of all types. 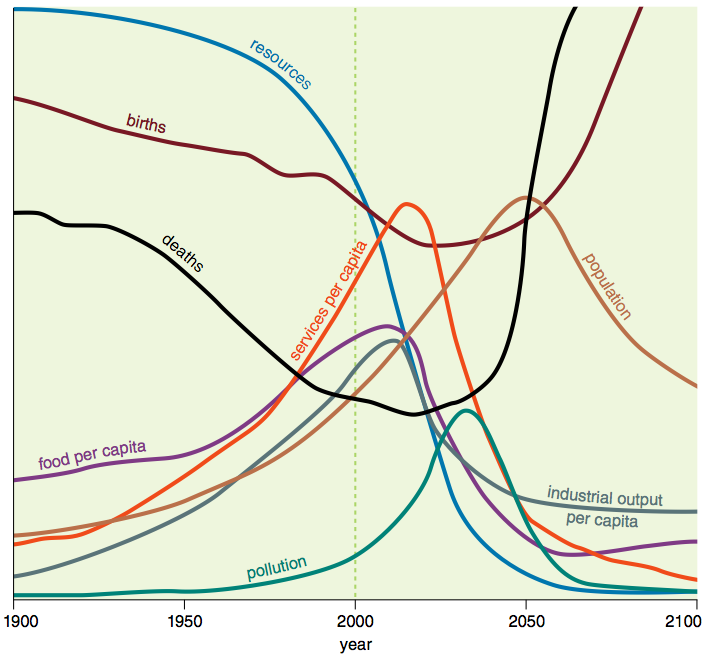 Including the physics aspect of the economy would lead to many periods when sharp changes take place. When these sharp changes take place, there might be wars, collapsing governments, and epidemics, all causing large numbers of deaths. 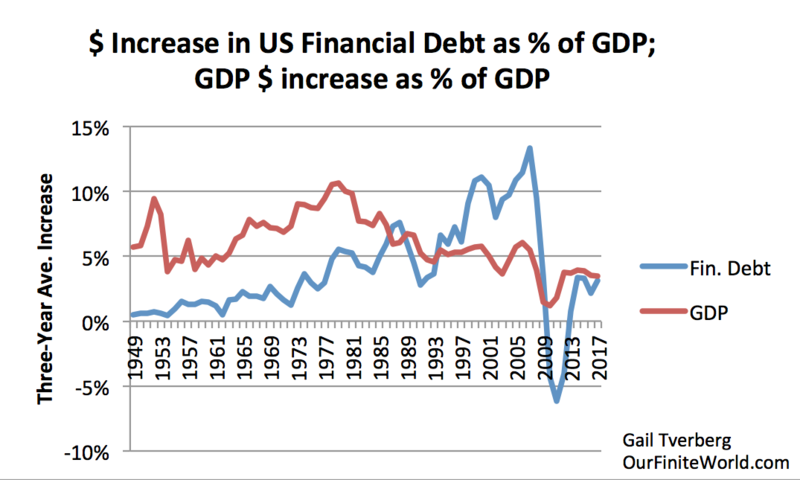 Debt bubbles might pop, causing deflation and widespread banking problems. These types of events are similar to those that economies have experienced in the past. There is no reason to expect that today's world economy will have unusual lasting power. Anyone who has watched bread rise in a bowl can see the implications of growth within a finite structure. It doesn't take very long for the volume growth of bread dough to exceed the space available. Even if the bread maker pushes the dough back down again, the effect is only temporary. The bread dough quickly rises again to overfill the bowl it is in. By raising interest rates, regulators could easily send part, or all, of the world's economy to a financial crash that is worse than 2008's. Or the economy could again reach limits, by itself, with just a little economic growth. In some sense, the world economy is very close to filling the bread bowl, as it was before the 2008 crash pushed it back down. The question becomes, “Can consumers bid up the prices of all of these minerals sufficiently, to encourage enough reinvestment to solve the world's commodity supply problem?” Food prices would likely need to be bid up as well, because oil is used heavily in the production and transport of food. Because of China's problems, the country will necessarily need to cut back on manufacturing, road building and home building in the years ahead. (This would happen, with or without Trump's tariffs!) For some minerals, China currently represents over 50% of the world's demand. 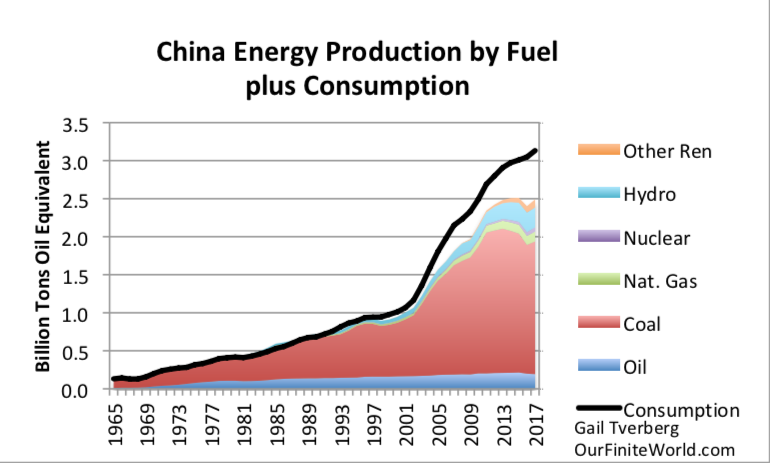 China is the largest oil importer in the world. It is doubtful that China can make major cutbacks in its use of commodities without lowering prices for many commodities worldwide. We are dealing with a situation where a large number of people suspect, at least vaguely, that the world economy is like bread dough about to outgrow its bowl, but this is not an issue anyone really wants to quantify. Everyone wants solutions; they don't want a better delineation of the problem. Repeated publication of climate change forecasts is, in a sense, a denial of the possibility that we may be facing resource limits that are close at hand. Such publication is saying, in effect, that the closest limit that citizens need to worry about is the climate limit. Also, the reliance of researchers on the past work by others in the same field tends to reinforce what are essentially incorrect models. Cross-pollination across fields is difficult, given the technical nature of today's academic research. Furthermore, it becomes increasingly difficult to properly model a situation that is very complex and depends upon non-linear interactions. (e) Adding technology isn't really a solution to the debt problem, because it tends to make the affordability problem worse. The problem is that while adding technology seems to lead to more employment for a few elite workers, it tends to displace lower-wage workers at the same time. The spending of lower-wage workers is really needed if adequate demand for commodities is to be maintained. 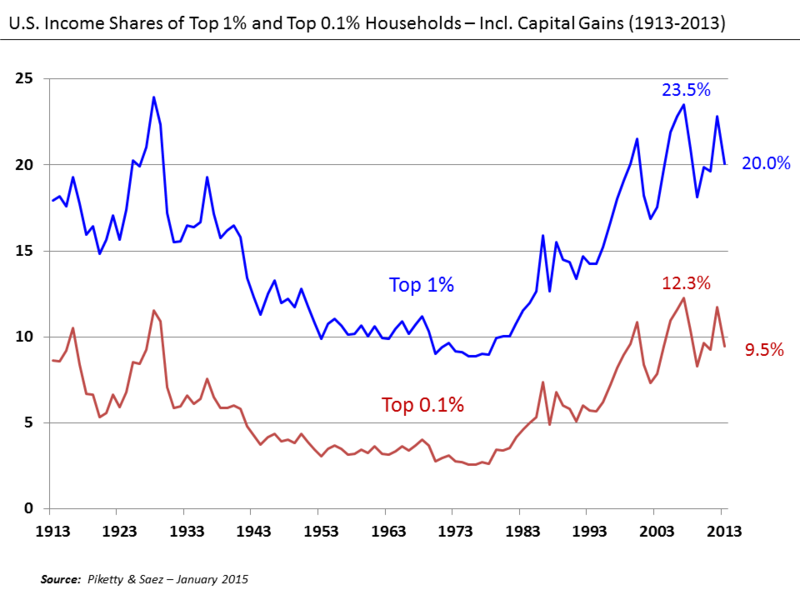 Additionally, the ownership of the technology-related capital goods tends to be concentrated among the elite; this further shifts wealth from the non-elite to the elite.